Comm Eye Health Vol. 31 No. 101 2018 pp 10. Published online 19 May 2018. Consultant Ophthalmologist: Birmingham Children’s Hospital, Birmingham, London, UK. It is important to learn the early signs of retinoblastoma. Early detection, diagnosis and treatment depends on it. Squint: one eye turns in or out (not as common). A visible tumour (fungating mass) involving just the globe, or extending to the orbit and/or the face. Change in iris colour (heterochromia). Occasionally nystagmus (searching eye movements as a result of the tumour involving the central part of the retina (macula) in both eyes). 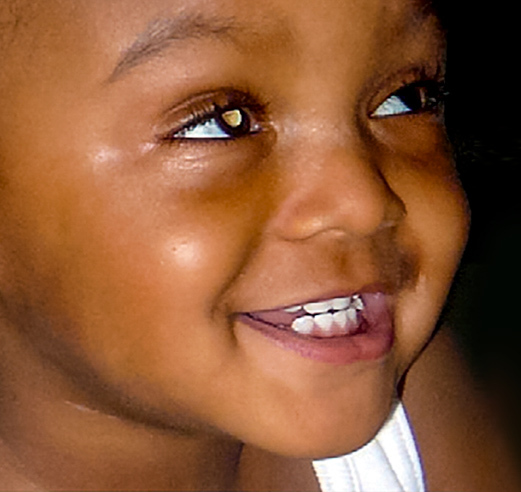 Children with non-germline retinoblastoma usually present later, often at the age of 2–3 years. The most common presenting features in patients with non-germline retinoblastoma are leucocoria (an abnormal white reflection from the retina) and squint (less common). Note: If a child presents with unilateral retinoblastoma in the first year of life, it may be germline (p. 7). The child has a greater risk of developing more tumours in the same or the other eye. Careful screening of the fellow eye, throughout childhood, is essential for all children suspected of having germline disease. What are you likely to see where? In high-income countries, children with retinoblastoma may present with reduced vision, an acute red eye or orbital inflammation. In low resource settings advanced cases with proptosis (forward displacement of the eye) or fungating orbital masses are seen more commonly due to late presentation. Table 1 Could this be retinoblastoma? Digital flash photography, often from a mobile phone, can show the white reflex in the pupil in some cases and lead to earlier detection; however, squint, refractive errors, and photographs taken from an angle can also produce the appearance of a white reflex, with only a minority of cases having retinoblastoma. So, although most causes of an absent red pupil reflex on a photograph are not retinoblastoma it is still a useful public education tool. In Honduras, it was associated with a reduction in the proportion of children with retinoblastoma presenting with advanced disease.